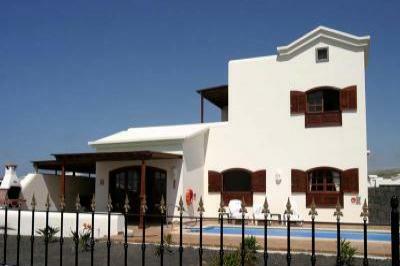 Casa Montaña Roja is a luxury villa having been completed late 2003.
comforts not usually found in rental properties. doors to the spacious terrace and private, electrically heated pool. there is no danger of traffic. prepared for a bumpy ride!). Look at our website for more details and photographs. cleaning,bed linen and towel provision. £70 per additional person per 7 nights up to a maximum occupancy of 5.
of £100 which is refundable upon your return from the villa.